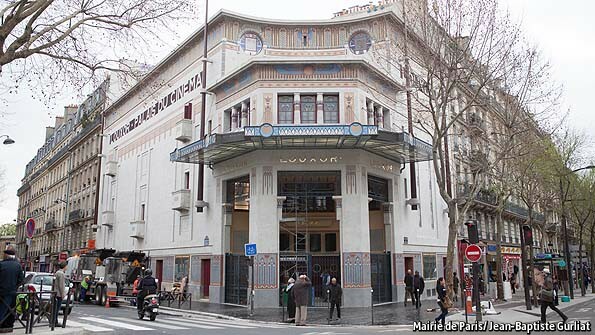 THE Louxor Palais du Cinema , north-west of the Gare du Nord in Paris, was once one of the jewels of Egyptian-inspired art deco. It opened in 1921 boasting pillars, papyrus motifs and pharaohs’ heads—to say nothing of a hall seating almost 1,200 film-goers. It was the heyday of silent films of the sort that “The Artist”  recently brought back to life. Parisians thronged to the Louxor, cigarettes in hand, to see the hair-gelled heart-throbs and hear the live orchestra that accompanied them. A decade later, as the talkies were taking over, the Pathé group bought the Louxor. They brought in bodice-rippers and American films, eventually replacing the neo-Egyptian décor with neo-Greek. After the second world war the cinema fell on hard times, as did its neighbourhood. Heavy immigration, mostly from the Maghreb and then sub-Saharan Africa, began to change the character of the “carrefour Barbès”, where three central arrondissements touch—the 9th, 10th and 18th. It became overcrowded and crime-ridden. By the 1970s the Louxor was showing Indian and Arab films, often in their original languages. A man who worked there recalls that what went on in the public lavatories was more interesting than the spectacles on screen. Instead of watching the films people were selling all sorts of things, women in particular. 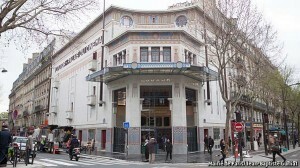 The Louxor screened its last film in 1983 before Pathé sold the building to a retail firm which wanted to build a store. But the firm’s plan did not prosper because the Louxor’s exotic façade had been listed for preservation. The place briefly became an Antilles disco and then the biggest gay club in Paris. From 1987 the building stood empty.